Time to make more room on the shelf! 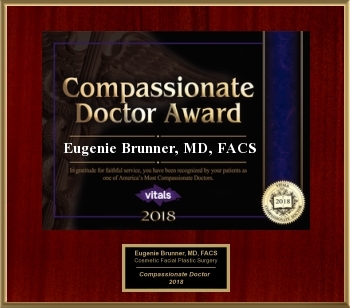 Dr. Eugenie Brunner received two awards from the 2018 Vitals Physician Awards Program: Patients’ Choice and Most Compassionate Doctor. As a facial plastic surgeon dedicated to patient care, safety, and results, these two titles mean a great deal to Dr. Brunner. Patients like you are why we are able to do what we love, helping others achieve their goals, build confidence, and feel beautiful at any age. The Vitals Physician Awards Program relies on individuals, not physician groups or medical companies, to vote for doctors in each category. In addition, physicians are analyzed based on a set of quality measures, including training, education, and practice history, to arrive at the winners in each section. We want to send a warm thank you to our patients for supporting Dr. Brunner and choosing her as your preferred facial plastic surgeon. If you’re ready to take the first step in your cosmetic journey, and you’re looking for a physician known for her caring, attentive, and patient-focused approach, we hope you’ll reach out to us and schedule a consultation. For more information about these awards and Dr. Brunner’s history of accomplishments, please reach out to our team.